The theme of our two Cargo manipulation groups for the past two weeks has been "EVERYTHING IS CHANGING!" Over the past few days we have gone back to reevaluate some of our assumptions. Phrases like "What if they were both bottom rollers? ", "The only thing changing is gravity". "This is the same really complicated sketch we have been looking at for 2 weeks, I just remade it and added colors. ", "Who's spring is this? ", "Everything is Changing! ", and "What if we just flipped it all upside down?" have all been said and have been pretty important to the design process. Most of the robot gets designed in 2D like this before moving to 3D for the prototyping. This morning that was all we had after a lot of discussion last night about the changes and yes "flipping everything upside down". After about 2 hours of really fast CAD this afternoon we had a plan to build this. Our roller system this year uses a 7/8" dead axle shaft with a 1.25" OD polycarbonate tube around it. 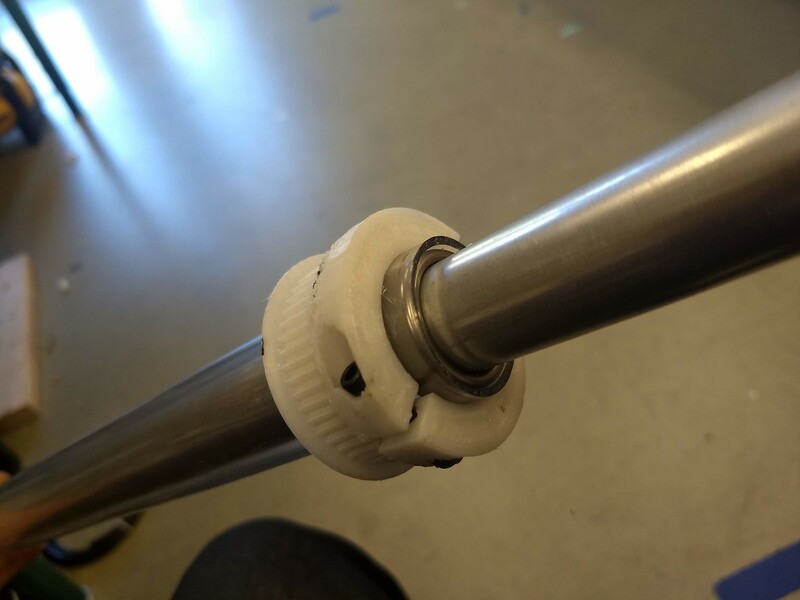 The polycarbonate tube is running on two needle bearings and it's driven by a 3d printed pulley that has an integrated clamp to grip the tube. This setup lets us install and remove the roller with only two bolts going into the tube connector nuts pressed into the ends of the 7/8" shaft. This version of the intake still has a lot of testing to do, and it's very possible that everything may change again but we made a lot of progress today. We have spent some time putting together a more complete intake prototype. Our protopipe system has been a huge help with this. 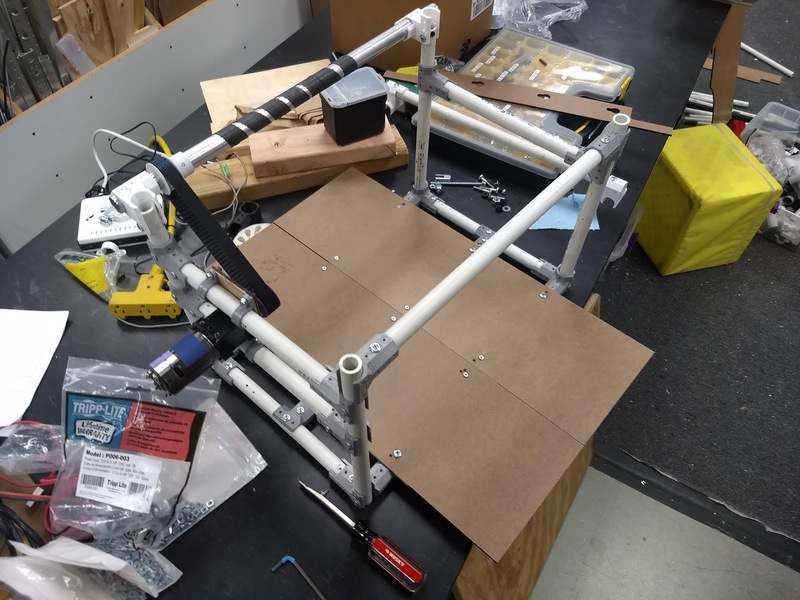 The same frame we used for the original prototype has been able to be rapidly modified in multiple ways to continue it's usefulness in our testing. 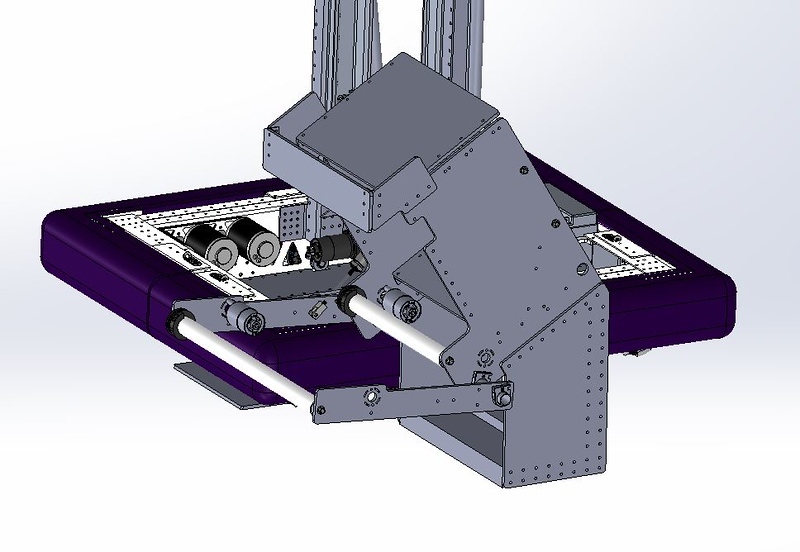 We have been able to build the intake mechanism to the same angle and heights that we have in CAD and even be able to add multiple moving and hinged parts. 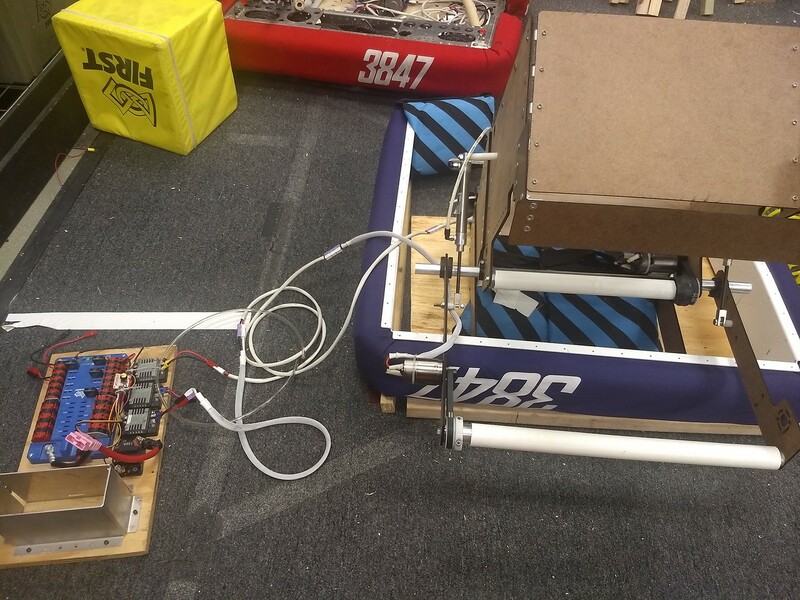 An old set of bumpers were set on 2x4s to mimic this year's bumper height and the prototype was placed inside of them at the right distance and height. 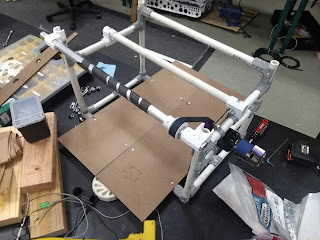 We found that we can easily add constant force springs to the protopipe setup by just sliding them over a section of pipe and screwing them in to the moving arm. 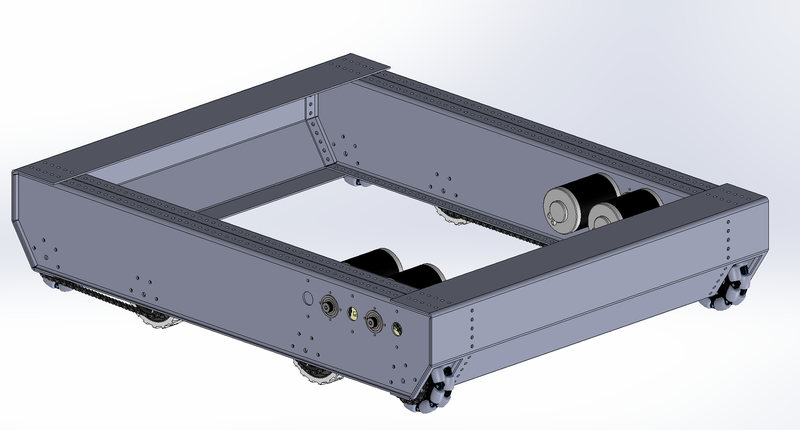 The elevator on this year's robot is a simple two stage cascading chain lift. Nothing too complicated. The cargo floor intake raises the ball to 15" from the floor with the elevator completely down so that we only need to lift ~63" to get the cargo centered with the highest rocket opening. 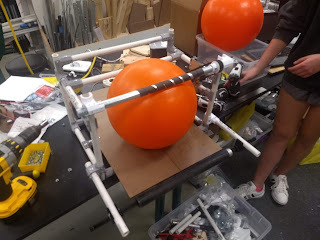 We have been successfully using Protopipe this season to test our cargo designs. It has let us make rapid iterations. Today we quickly added a bottom roller to help eject cargo further than we were before. On the real design this bottom roller may be accuated to help us intake cargo from the floor as well. The idea for our climber came from sforbes' youtube video below. Since then he has posted another video that is actually closer to what we are really working on. Here are some of the current sketches of our climbing mechanism. 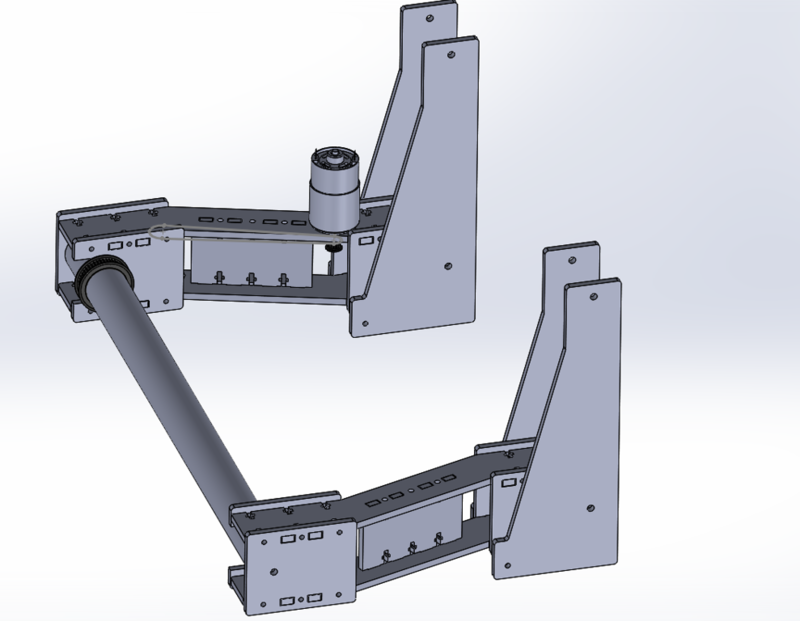 We are planning for the main central arm to be sheetmetal and for the two rear arms to be round tube with tie rod ends since those members are mostly only experiencing forces in tension. 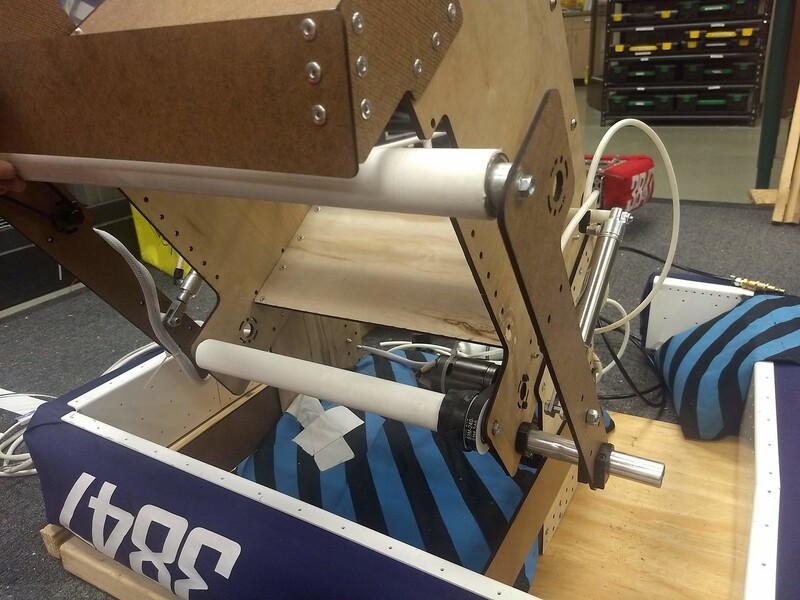 We have an updated cargo mechanism prototype that is helping us solve for some of the variables for that mechanism. We are able to change the height of the roller, the length of the bottom plate, the locations of the rear stop bar and more. This will hold the cargo on the elevator. The mechanism will intake it from the over the bumper ball mechanism. 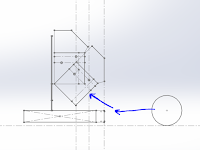 The tilt of this mechanism lets us start the cargo on the elevator higher reducing the amount of height we need to in our elevator to reach the 3rd level of the Rocket. This is the intake for hatches from the loading station. It's mounted above the cargo mechanism and flips into the correct orientation when the cargo mechanism is pointed down. This allows us to start the match while holding a hatch and still flip it down closer to the edge of our frame perimeter. As we start bring our ideas to life in CAD there have been a few robots that we keep coming back to for inspiration. 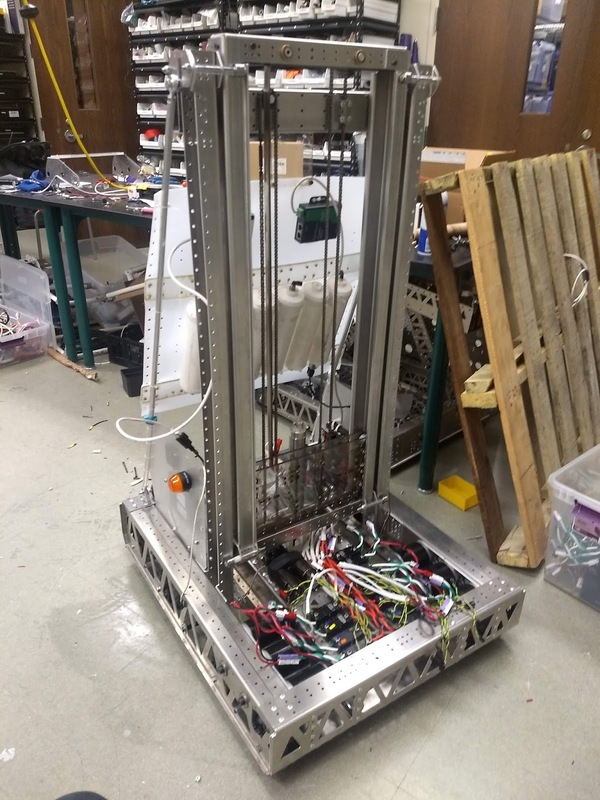 GUS' 2011 robot featured a great chain driven cascading lift and a simple wrist intake. We have been heavily looking at their lift and power transmission for the elevator to get ideas for our elevator for this year. Simbotics' 2011 robot also had a cascading lift but there design was based around sheet metal manufacturing which more closely mirrors how Spectrum builds it's robots. 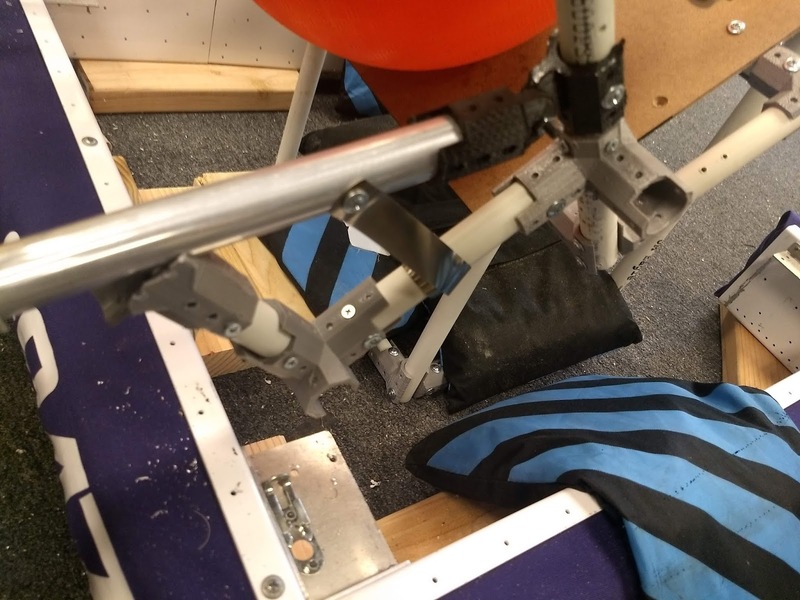 The Robowranglers' 2011 robot features an awesome extending link for the top bar on it's 4 bar arm. We have been looking at this CAD as an example for how to do a simple extension that we will be using on our Cargo intake. Here is the current state of one of the intake extensions. The team spent the majority of their time in the lab today tuning their subsystem designs. The subsystems that require sheet metal are really trying to meet next week's deadline and are hammering out the last big chunks of the design before lightening. The carriage is starting to come together. Bearings have been added to the side rails of the elevator as well as being sandwiched in between the plates on the carriage. Part of today was also focused on intake geometry. The cargo box carries the ball to different positions on the elevator without obstructing the hatch mechanism. The hatch intake has undergone an upgrade, including a new feature. 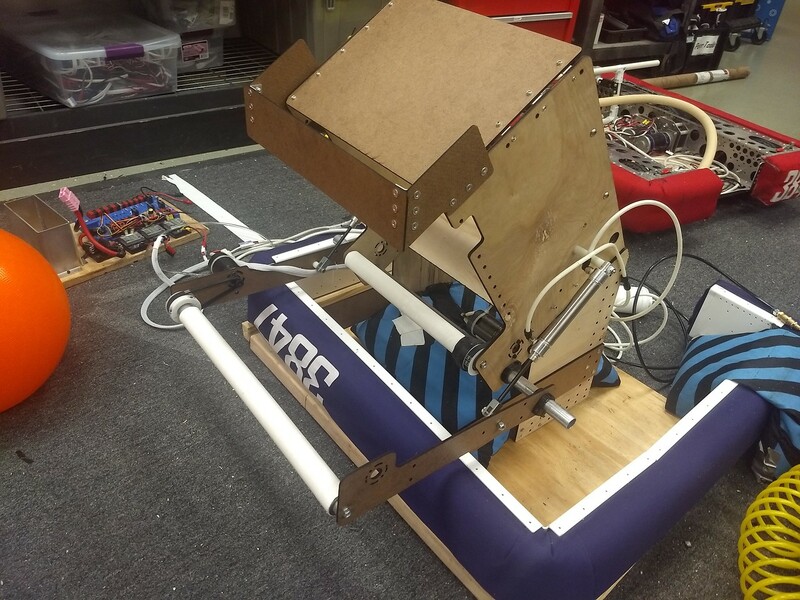 While still in the prototyping stage, we had implemented a 'finger,' a 1/4" thick piece of Lexan placed above the (duck!) beak. 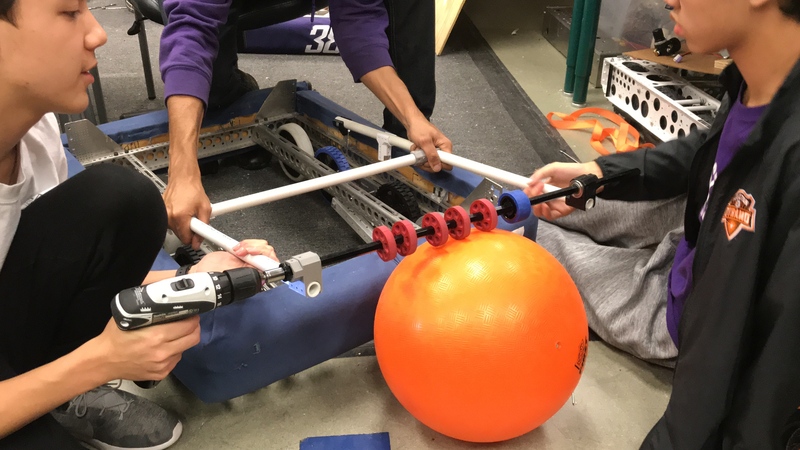 A pneumatic cylinder actuates the finger and allows it to grab and secure that hatch so that any jostles by other robots do not impede the hatch from reaching the intended deployment zone. 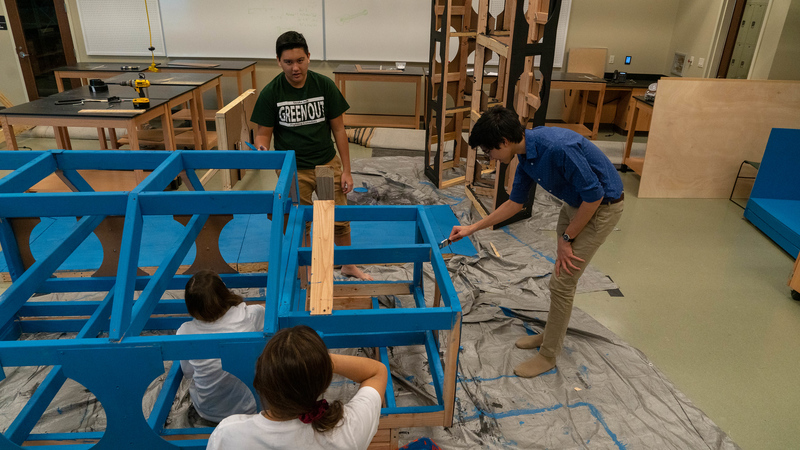 The team has divided into two warring tribes who are battling for control over the name of the 2019 robot. Not really, but in all seriousness, we are diligently working while we await Allen's return from the blizzards of the north tomorrow morning. 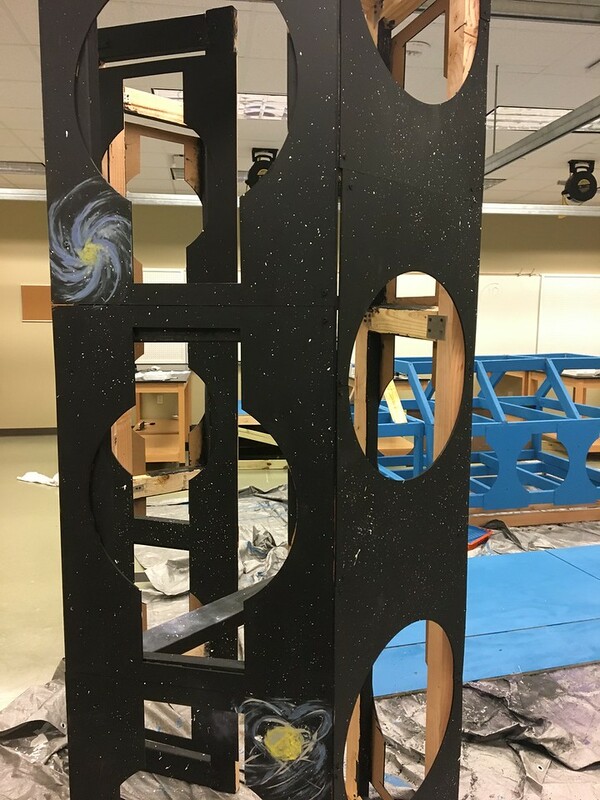 Today was no ordinary day of build season for Spectrum. It was our first of two days without our Lead Mentor, Allen Gregory. Sadly, FIRST Headquarters has claimed him for the weekend for LRI training. Despite Allen’s absence, we were still able to make progress on our subsystems. 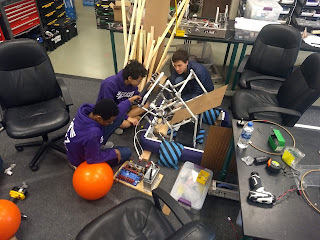 This year we positioned our gearbox at the front of our robot to create space for our climber. Each Side Panel will feature two traction wheels in the middle and an Omni wheel on each outer edge. 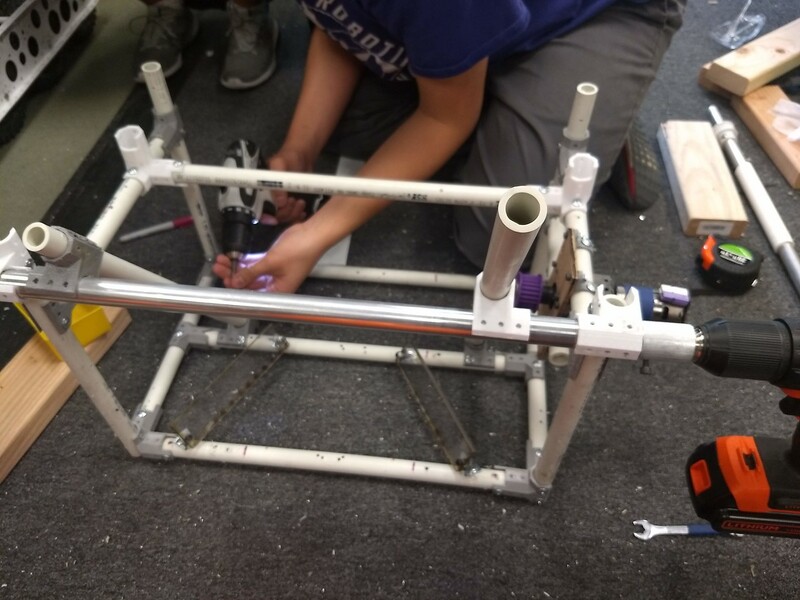 Our Drivetrain has progressed rapidly and we are hoping to send it to our sheet metal sponsor, SolarCraft, sometime late next week. We continued to add to our hatch panel ‘DUCK!’ intake by designing in a pneumatic actuated ‘finger’. The ‘finger’ will keep the hatch panel in place during pickup and transportation until it gets scored. We made a prototype out of protopipe for our cargo carrier mechanism with a simple roller and dustpan design. This cargo mechanism will be attached to the inner carriage elevator and will spit out the cargo to score. One of the projects we have added this year is building an MCC robot with some our new students. 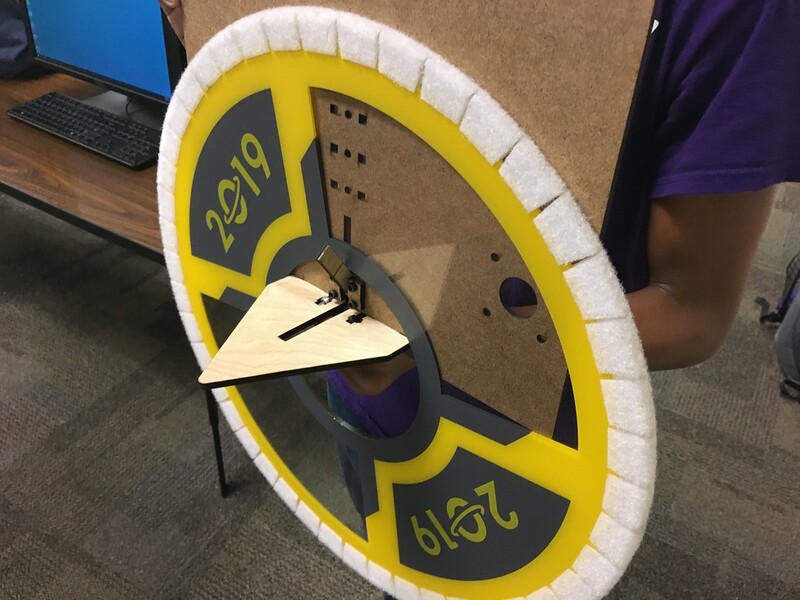 This gives us the ability to have them build, wire, and program a robot before the design for our actual 2019 robot is complete. 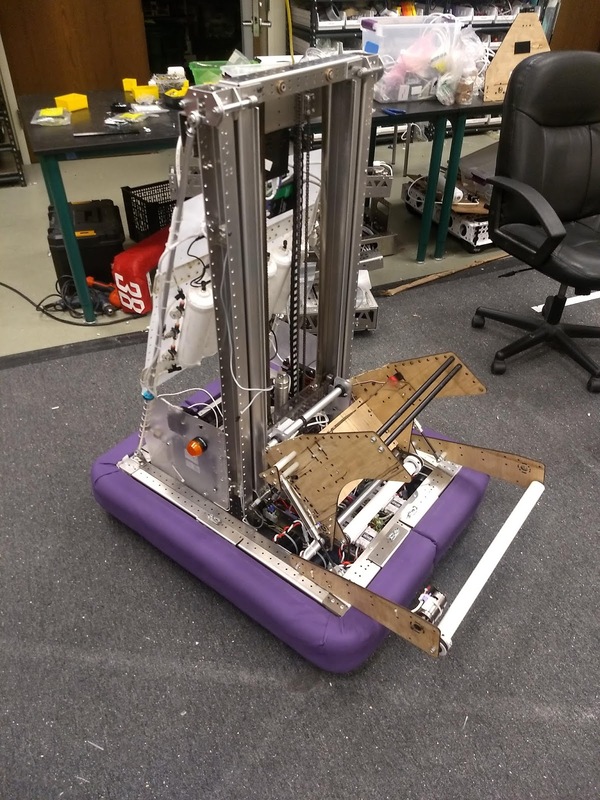 It's also lets us have a robot to practice with/against and an example robot for the teams that we help throughout the season. The goals for this robot are to be similar to those we explained in the FRC Guide to the MCC. We want this robot to be the 3rd robot on a competitive alliance. We are still developing this but we wanted to get the basic idea published as teams are starting to finalize their designs and we hope some teams will be able to use ideas from this design to help them this season. The current version of this robot ignores the HAB end game. It can drop off of HAB lvl 2 to start the match but is unable to climb up to lvl 2 or lvl 3 at the end of the match. It is a rather light robot and most of its weight is in the rear so it may be a good choice for a robot that lifts others on to the lvl 3 platform. Only 1 or 2 robots will be able to climb to lvl 3 in each match and it's likely that the highest seeded teams will be able to climb on their own so building ramps (also ramps are just hard in general) or other mechanism will most likely not help get you picked by high ranking teams. If you take anything from this please let it be that ramps are harder than you think, and teams are very bad at driving up ramps so please be very cautious when deciding to build a ramp bot (or better yet just don't build a ramp bot). The hatch mechanism on this robot isn't fully flushed out but it will be able to score on all lvl 1 hatches using pneumatics and velcro. 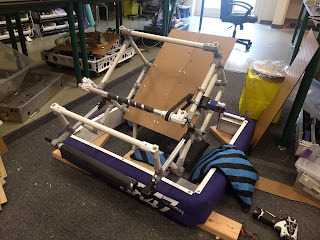 There is also enough room on the back for an alternative hatch mechanism if your team develops something else better than velcro and pneumatics to push the hatch off. Cargo is where this robot shines and is where we believe the most productive 3rd robots will have their strengths. Each cargo cycle is worth 50% more than a hatch cycle and you can start the game with 6 null hatches pre-installed giving you 6 free 3pt cargo cycles before you need to do a hatch cycle for 2 points. Floor loading lets this robot utilize the depot for its cargo cycles and free up the loading stations for the faster robots on its alliance who may have well practice or pre-programmed paths to/from the feeder station. 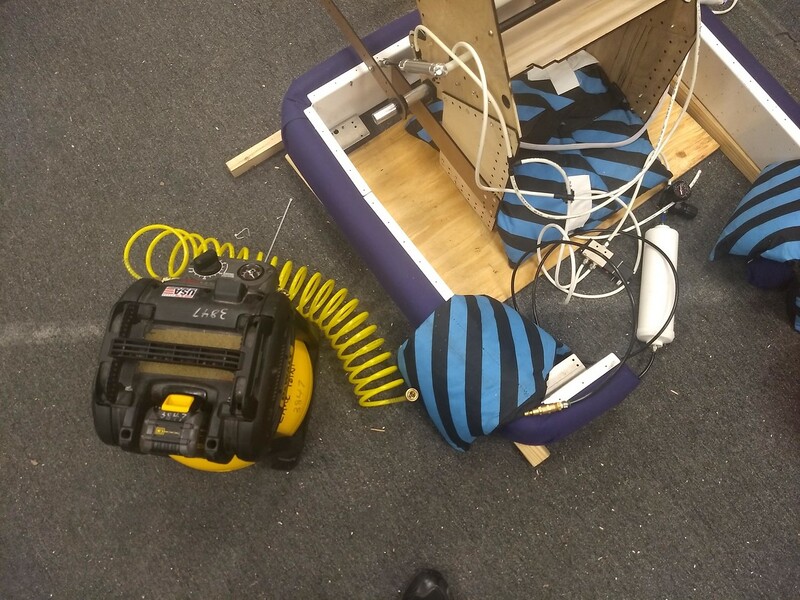 Floor loading reduces your cycle time because it's possible that the balls will roll across the ground and come near your robot without you having to go back into the HAB. 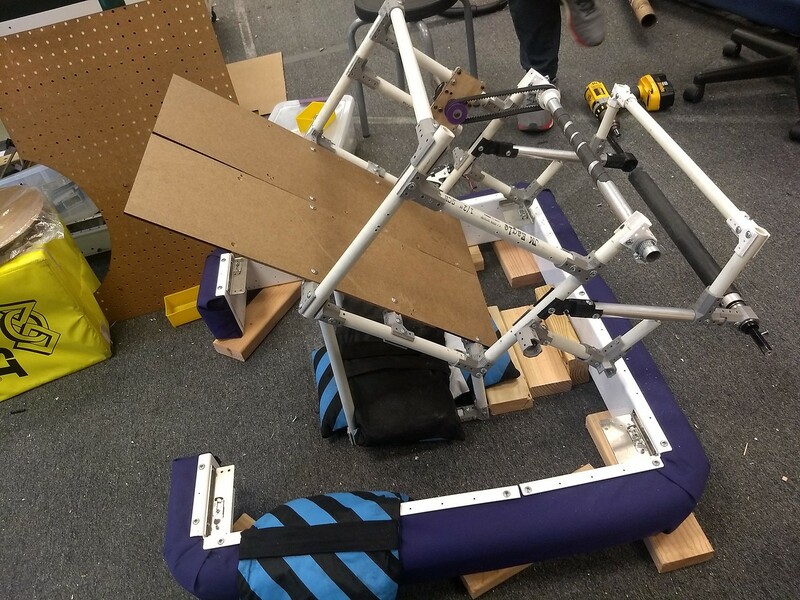 The in-frame intake mechanism means that while playing defense this MCC could take a cargo ball and bring it back to their side of the field to score. This will slow down the cycle time of their opponents. Those 3 scoring locations add up to a potential of 14 cargo scoring locations (not counting the 2 front cargo ship spot that start with cargo). Having the ability to score in Rocket Lvl 2 means that if this robot is paired with a robot that can hatch lvls 2 & 3 and score cargo in lvl 3, each of them only needs to score 6 game pieces to be able to complete the rocket and get the ranking point. The pictures shows a square 28"x28" AM14U3 because that is the drive base we happen to own but any kit chaiss dimension can perform this role, you would just have to change some of the dimensions of the arms and tower. A wider kit bot could have a wider intake, a longer kit bot may have more room for a hatch mechanism on the back. 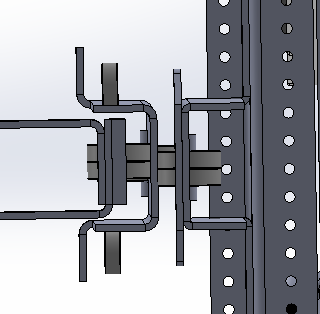 Reminder to make sure you cut your kit chassis to be within the 120" frame perimeter rule. The design uses mostly 2x1 and 1x1 aluminum extrusion but it most of the cases this could be exchange for other materials that you already own or that you like to use. A robot with similar abilities can be built from wood, REV extrusion, Andymark Peanut extrusion and many more options. 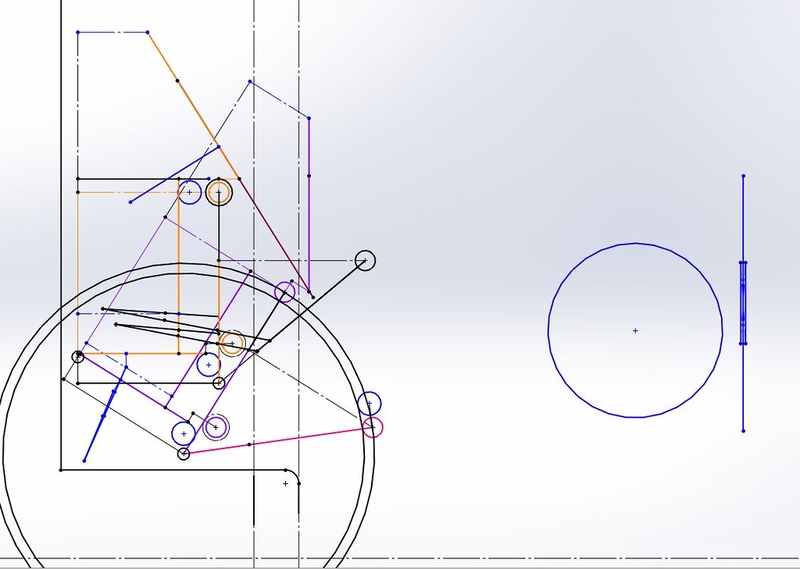 The CAD doesn't include all the gussets that would be needed to connect all the parts together. A single motor, gearbox, and chain reduction is able to move the cargo intake up to score. There are a variety of ways to build a single jointed arm, the images show a AndyMark 100:1 57 gearbox mounted to two REV Universal Motor Brackets, driving a VEXpro 12t to 60t sprocket reduction. Surgical tubing would be added to the arm bars at the rear to help counterbalance the arm. The intake is a simple roller, this could be wheels or a drum as shown in the images. The drum is based on the VEXpro Versaroller System. Many different gearboxes could power the intake including a Versaplanetary, or AM 57 Sport. Another option is to use the Two Sport Gearbox that teams received in the kit of parts but only install a single motor, that is what is shown. Single pneumatic solenoid valve drive the two cylinder to release it from our velcro. Similar to prototype we posted here. With only 2 motors and one solenoid valve used for scoring this Destination Deep Space robot would be very simple but able to contribute a lot during match it plays. This CAD was done very quickly just to be a visual tool to help teams understand our plan. We will be developing it more before building our version of the Spectrum MCC this season. Much of the systems are incomplete so only use this as a model to get ideas from and not detailed plans to build a complete robot. The STEP file for this quick CAD can be downloaded here. We put together a purchase list that explains some of the items we recommend using in the Spectrum MCC.